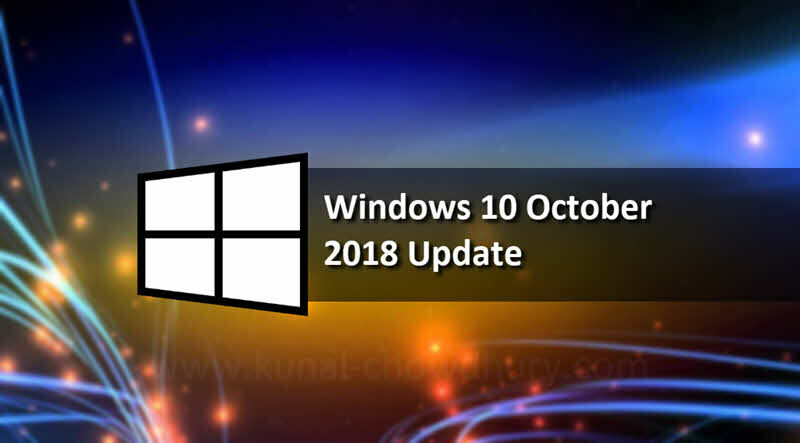 Microsoft released the next major feature update (version: 1809) of Windows 10, which is known as Windows 10 October 2018 Update The key feature list includes: Dark Theme for File Explorer, new snipping experience, cloud clipboard and more. If you haven't receive the upgrade notification, head over to: Settings | Update & security | Windows Update | Check for updates. Windows 10 October 2018 Update (code named Redstone 5 or RS5), which was already tested by Windows Insiders (both Fast Ring and Slow Ring) over the last few months. But this time, Microsoft didn't push any build to the next ring, "Release Preview", and directly released to the public on 2nd October 2018. How to get the Windows 10 October 2018 Update? The last Windows 10 feature update rollout, the Windows 10 April 2018 Update, utilized Machine Learning (ML) to identify devices that were ready to update. That gave Microsoft the ability to safely rollout the Windows 10 April 2018 Update quickly to the end users. With the Windows 10 October 2018 Update, Microsoft is expanding the use of Machine Learning and intelligently selecting devices that the data and feedback predict will have a smooth update experience. According to the giant company, though the Windows 10 October 2018 Update has been released globally, but the users won't get the update notification until next Patch Tuesday. But, the users can manually check for updates by navigating to the Settings | Update & security | Windows Update | Check for updates. Alternatively, click here to check for updates. If you are an advanced user, you can download the ISO/DVD image of the Windows 10 October 2018 Update by using the Media Creation Tool. What are the key features introduced in Windows 10 October 2018 Update? Microsoft added text zooming support to Notepad. You can now press CTRL + Plus and CTRL + Minus to zoom-in and zoom-out respectively. You can also use the mouse wheel by pressing the CTRL key to perform the zooming. Alternatively, View | Zoom menu item can also be used. You can restore the zoom level to original state by pressing CTRL + 0 (zero). 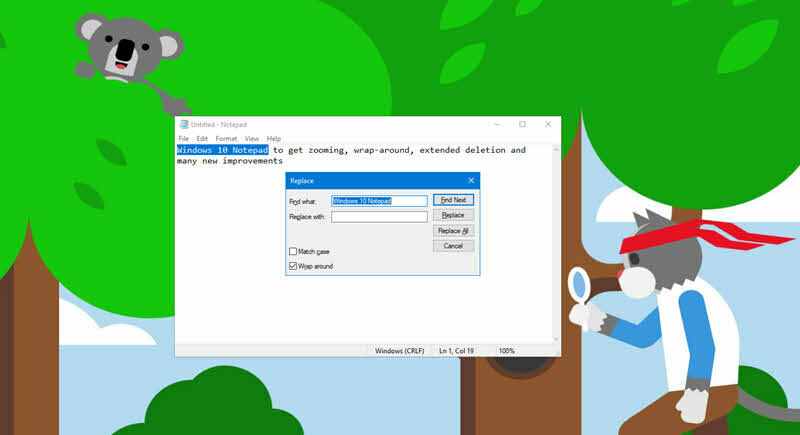 Want to remove notepad contents word-by-word? Microsoft now added CTRL + Backspace and CTRL + Delete shortcut key combination to delete previous word and next word (from the current cursor position) respectively. The new update brings the ability to do wrap-around find and replace. Anything that you have selected in notepad and then opened the find dialog, will be auto-populated in it. Notepad will now also remember the previously entered search phrase and the state of the checkboxes. When word-wrap is enabled, it is now possible to see the line numbers and column numbers in the status bar of the notepad. Apart from these, performance improvement has been added to notepad. You can now open the large text files without any performance degrade. With Windows 10 October 2018 Update (version 1809), Microsoft added some cloud functionality to Windows 10 Clipboard. You can now copy some content on one device and access the same content from another cloud connected device. 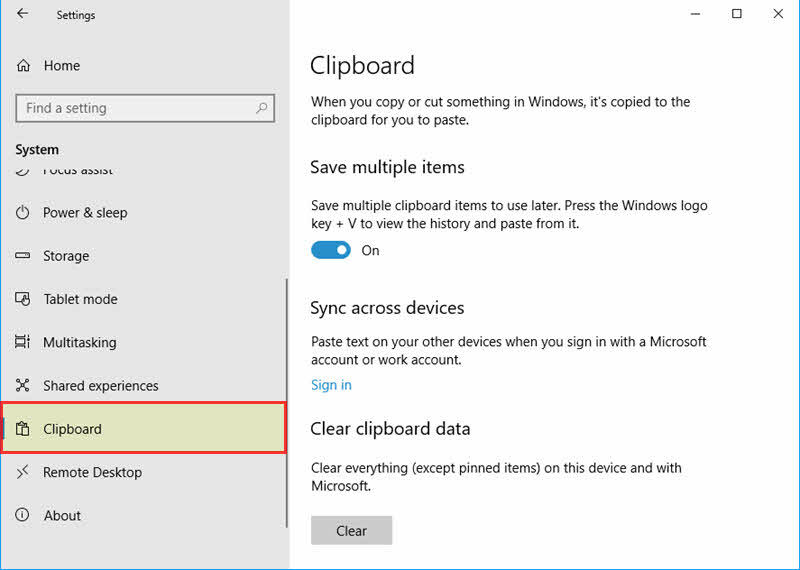 Your Windows clipboard will roam across your devices using the same technology which powers Timeline and Sets. Using it, you can not only copy-paste content, but can also pin a item that you find yourself using regularly. A new settings page has been introduced to control the user experience. You can find this page under: Settings | System | Clipboard. From there (once you sign-in with your linked account), you can select whether to sync your keyboard or clear your clipboard content. When you hit Win + V (instead of Ctrl + V), you will be able to paste from the clipboard history and pin the items you find yourself pasting more than once. With the new update, Windows Update Service will now automatically determine the least disruptive opportunity, outside of Active Hours, and will use an enhanced Machine Learning powered activity to check if a user is going to be away for a while or is only stepping away temporarily. 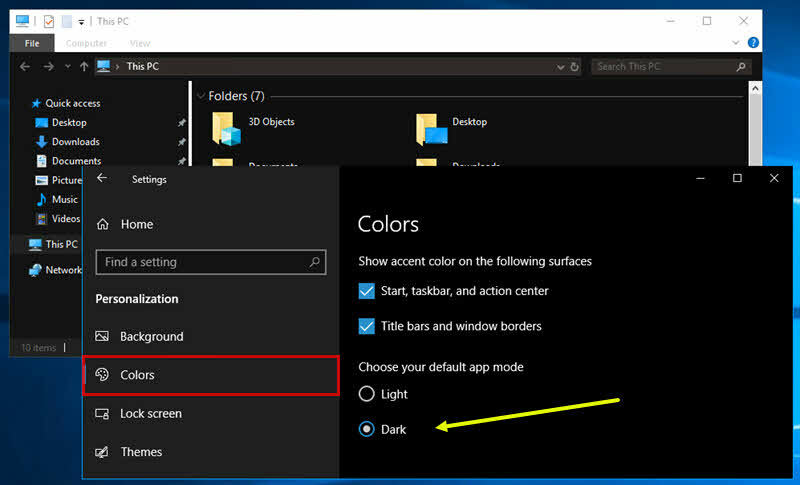 This new build also enables you to apply Dark Theme to your File Explorer. To set this, go to Settings | Personalization | Colors and set the Choose your default app mode to Dark. When you apply this, it will also gets applied to Common File Dialogs (New, Open and Save dialogs). If you are an Android phone user, you can now drag and drop photos from your phone onto your PC. You can now copy, edit, or ink on that photo, right from your PC. With the 'Your Phone' app, you can now get instant access to your Android's most recent photos on your PC. Not only photos, but you can now also compose and read messages from your PC using the 'Your Phone' app. At this moment, this is only supported when connected to Android mobiles. Microsoft not yet confirmed by when this feature will be available to the iPhone users. Not only this! 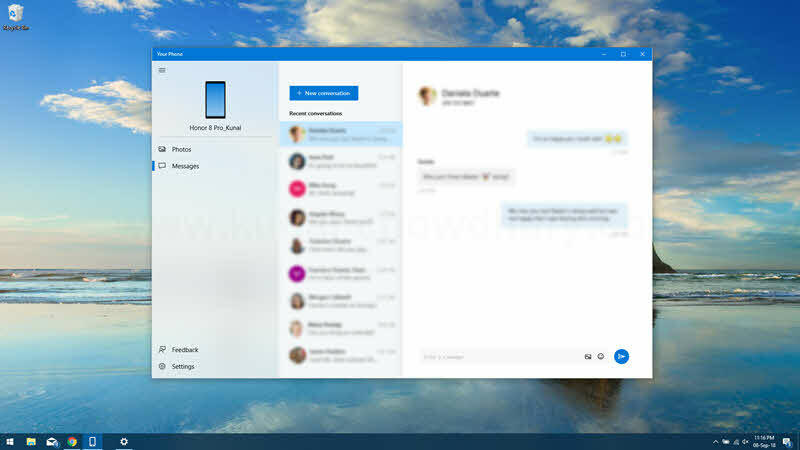 Windows 10 October 2018 Update also includes many new improvements to Microsoft Edge, search previews, Emojis, Task Manager, Game bar, SwiftKey powered virtual keyboard, better privacy and many more. If you have come this far, it means that you liked what you are reading (Windows 10 October 2018 Update is now available for download).